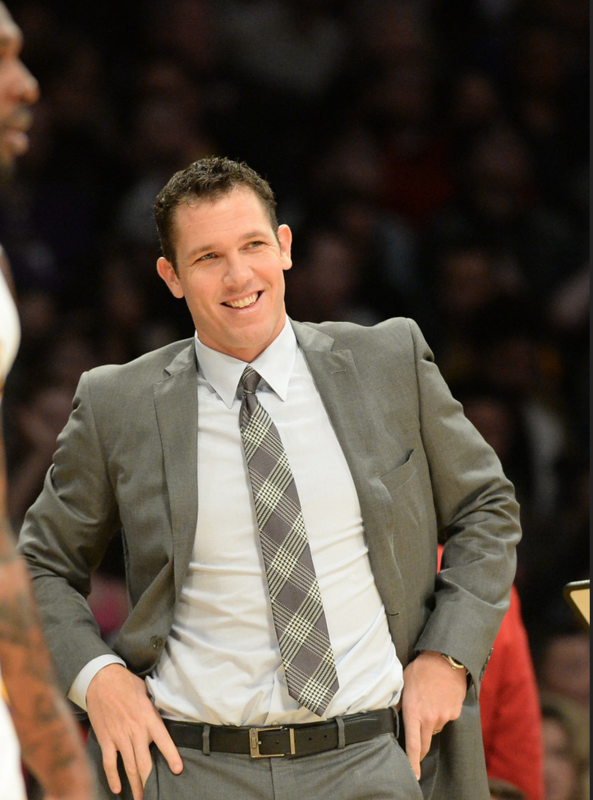 EL SEGUNDO — As he wore a smirk on his face, Lakers coach Luke Walton suggested he will change his bench rotation for when the Lakers (19-41) host the Charlotte Hornets (25-34) on Tuesday at Staples Center. “Tune in and see,” Walton smiled. Here’s an early prediction: Walton will feature guard David Nwaba after the Lakers signed him on Tuesday to a 10-day contract. While the Lakers will monitor Nwaba’s growth after the undrafted 6-foot-5 guard starred with their Development League affiliate, Walton also held out hope Nwaba could improve something that has plagued his roster all season. 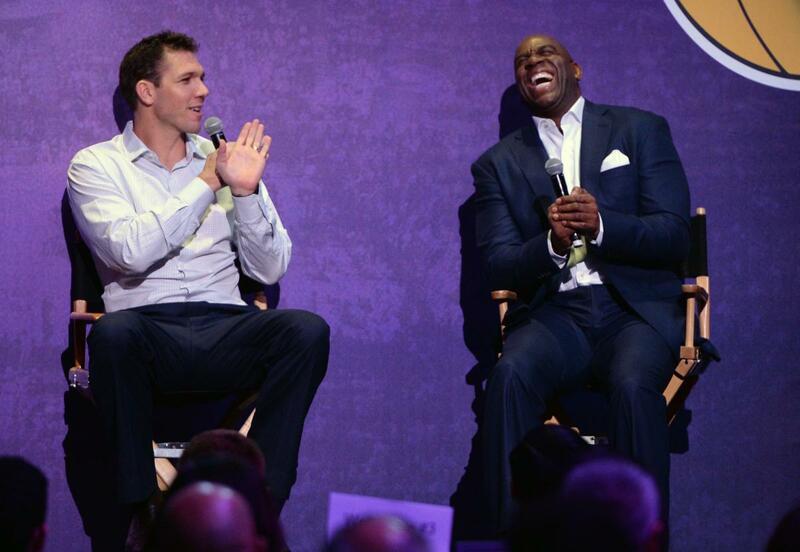 Head Coach of the Los Angeles Lakers Luke Walton, left, and Magic Johnson, Lakers President of Basketball Operations, share a laugh during the The Los Angeles Sports & Entertainment Commission (LASEC) 13th annual LAKERS ALL-ACCESS, at the Staples Center. Los Angeles Calif., Monday, February ,27, 2017. LOS ANGELES — From up above, Magic Johnson imposed a towering presence as he sat on a balcony overseeing the practice court during Monday’s session. Down below, Johnson’s stature has loomed large as he has offered players individual instruction. As the Lakers’ new president of basketball operations, Johnson has wasted little time stamping his imprint on a team he once led to five NBA championships during the Showtime Era. He became involved with the trade deadline. He traveled with the Lakers for their two-day trip to Oklahoma City where he dined with the Lakers’ coaching staff, watched practice and provided feedback. He did the same thing during Monday’s training session in El Segundo. LOS ANGELES — In a move that opens up a spot on the Lakers’ roster and allows a veteran point guard a chance to join a playoff team, the Lakers waived reserve guard Jose Calderon on Monday after negotiating a buyout. It’s not immediately clear how the Lakers will fill a roster that currently stands at 14. Perhaps the Lakers sign free agent center Larry Sanders after a recent workout. Or maybe the Lakers sign a 10-day contract to another player. 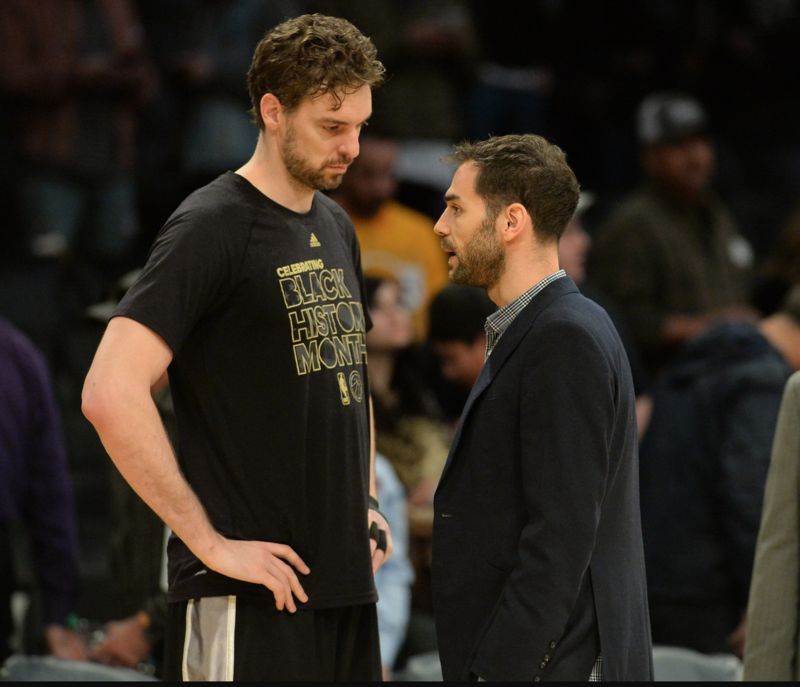 Meanwhile, it appears likely Calderon will join a playoff time once he clears waivers. The Golden State Warriors are among the teams interested in signing Calderon, according to a league source familiar with the situation. Players who are waived before March 1 can sign with a new team and be playoff eligible. Calderon’s agent Mark Bartelstein said he and his client feel “very appreciative of the Lakers doing this,” while also crediting Lakers president of basketball operations Magic Johnson. Though Calderon averaged a career-low 3.3 points on 41.6 percent shooting in 12.2 minutes through 24 games and 11 starts, the Lakers valued Calderon for mentoring the team’s younger players. The Lakers acquired Calderon last summer from Chicago and took on the final year of his contract worth $7.7 million. The 35-year-old Calderon will become an unrestricted free agent following the 2015-16 season. LOS ANGELES — The players’ stoic nature allowed him to hide in anonymity. His relentless aggressiveness and consistent efficiently soon became hard to ignore. Lakers rookie forward Brandon Ingram has tried to apply those concepts in hopes that his game will speak louder than his occasionally mumbled words. This time, though, Ingram saw how those qualities came at his expense. San Antonio forward Kawhi Leonard initially bullied Ingram on nearly every spot on the court, as he attacked the basket and drained outside shots with ease. Hours later, the Lakers suffered a 125-98 loss to the Spurs on Sunday at Staples Center as Leonard posted a team-high 25 points. Afterwards, Lakers coach Luke Walton still called Ingram “one of the few bright spots” after he posted a career-high in points (22) and field-goals made (10-of-15 from the field) in 35 minutes. 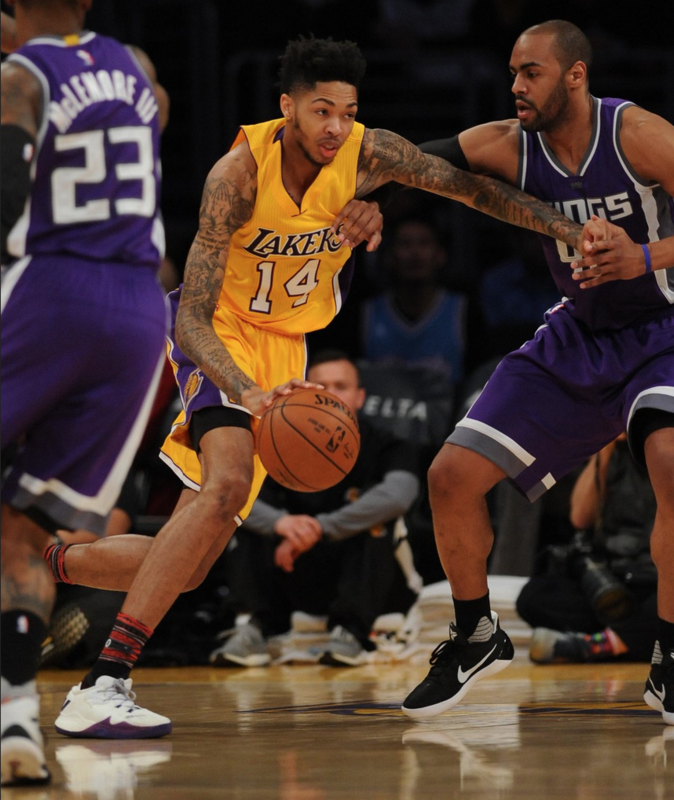 Yet, Ingram still faulted himself after Leonard “gave me a wakeup call” as he scored 16 first-quarter points. That stretch matched Leonard’s best quarter of his six-year NBA career. Walton did not sound as critical. He contended that Ingram did a “decent job” on Leonard and chalked up his prolific play to “just hitting shots.” Ingram saw things differently, though. OKLAHOMA CITY — The job description seemed nearly impossible to fulfill. Find a way to stop Russell Westbrook. Slow him down. Contest his shots. Do anything and everything to prevent Westbrook from achieving the inevitable. So with the Lakers suffering a 110-93 loss to the Oklahoma City Thunder on Friday at Chesapeake Energy with Westbrook posting his 28th triple double of the season, on paper it appeared the Lakers failed to live up to the task. Westbrook posted 17 points, 17 assists and 18 rebounds. Magic Johnson, the new president of the Lakers’ basketball operations, watched Westbrook accomplish something only Johnson and Rajon Rondo did in the last 40 years. All of those had a game in which they logged at least 17 points, 17 rebounds and 17 assists. Yet, Lakers coach Luke Walton found satisfaction that the Lakers forced Westbrook to be more productive at the foul line (8-of-9) after disrupting his efficiency from the field (4-of-18). 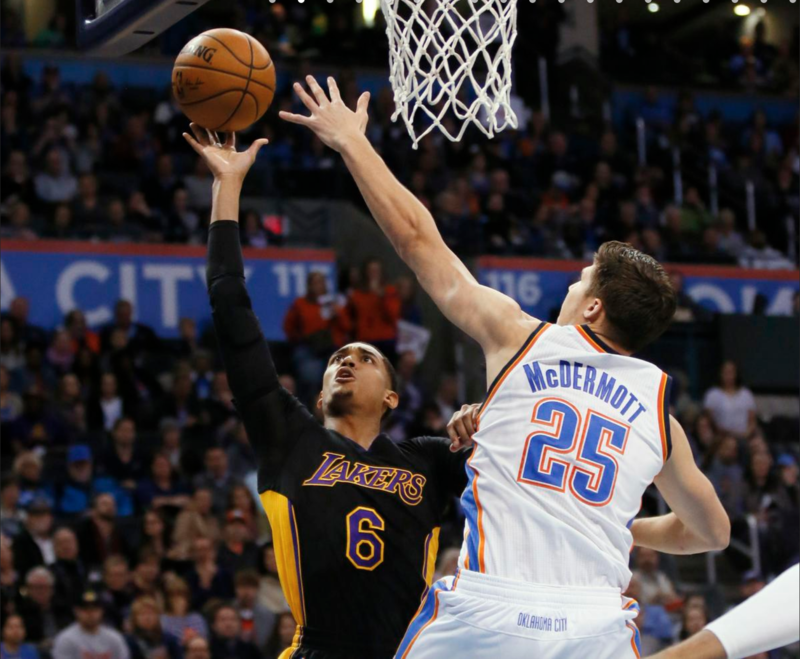 Walton said that Lakers guard Jordan Clarkson “really battled” in ensuring Westbrook did not always score as quickly as it takes for him to run across the court. 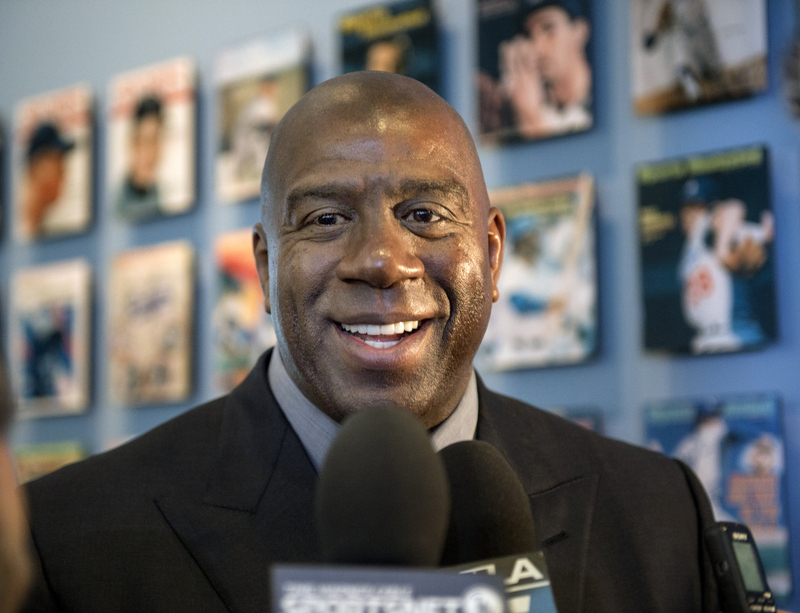 OKLAHOMA CITY — Even with the trade deadline passing and practice ending, Magic Johnson found another way to ingratiate himself with the Lakers. Johnson had dinner with the Lakers’ coaching staff here on Thursday night, and the session turned more into a group of people breaking bread. 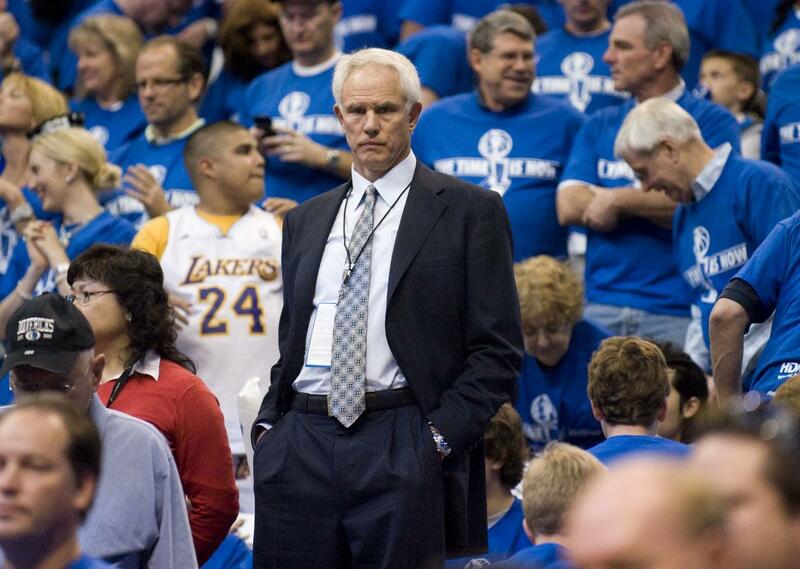 The frustration seemed understandable for Mitch Kupchak, who had spent a combined 30 years as a Lakers executive, 17 of those as a general manager and six others wearing the Lakers uniform. But Lakers president Jeanie Buss decided on Tuesday to name Magic Johnson the president of basketball operations while demoting her brother Jim Buss and firing Kupchak. 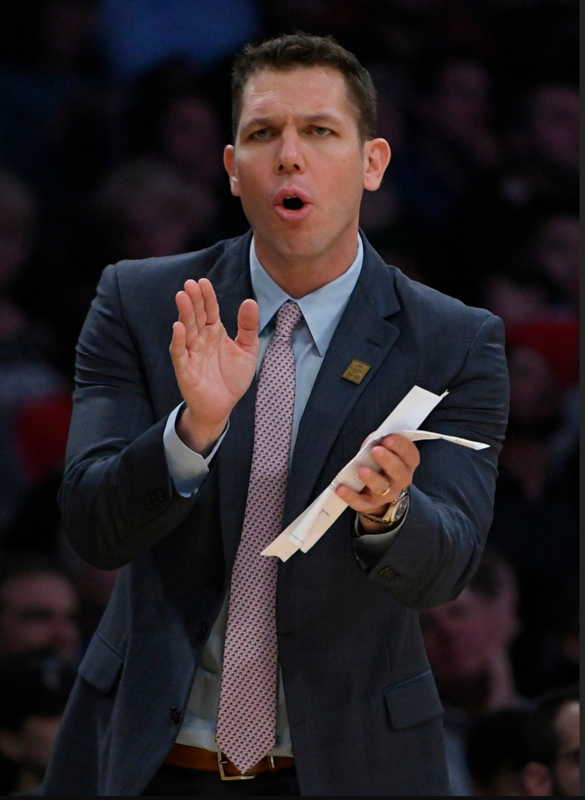 Although the Lakers have seen promise in first-year head coach Luke Walton and their young players, Jeanie Buss also became frustrated with the team’s 19-39 record and missed playoff appearances in the previous three years. “I am most disappointed that I won’t have the opportunity to continue to work with Luke and watch this young and talented team grow and eventually win in the Laker tradition,” Kupchak said in a statement issued on Wednesday. The Lakers have seen him both grow and shrink. But lately, Lakers rookie forward Brandon Ingram has mostly stayed on the court in crunch time so he can fully blossom. The Lakers have seen him show both flashes of greatness and inconsistency. But lately, Lakers second-year guard D’Angelo Russell has mostly sat on the bench without an opportunity to provide a happy ending. While Ingram and Russell might represent two key pieces of the Lakers’ young core, they also represent contrasting views on how Lakers coach Luke Walton wants to develop them. In the Lakers’ 97-96 loss to the Sacramento Kings on Tuesday at Staples Center, Russell sat out the entire fourth quarter after logging only eight points on 3-of-9 shooting and committing more turnovers (five) than assists (one). In the past four games, Russell has not cracked the 30-minute threshold. And though Russell has felt more empowered with Walton’s free-flowing offense and a starting position that has never been yanked other than injuries, Russell has logged less playing time under Walton (26.4 minutes per game) than during his rookie season under former Lakers coach Byron Scott (28.2). Russell said afterwards he has not talked with Walton about this reality. Lately, Brandon Ingram has not had to worry exactly at what point he would enter the game. Lakers coach Luke Walton has started him for the past three games with a clear eye on accelerating Ingram’s development at a time when that has taken bigger priority than results. But Ingram has had to worry about his own well-being. Walton said Ingram recently nursed a “big-time sickness” that affected his energy level in recent games. Walton said he first noticed on the morning of the Lakers’ loss last week in Detroit. Walton insisted that Ingram “feels much better.” But that captures why Walton has hesitated to make too many big picture evaluations on any positive and negative developments with his recent starting lineup switch. Walton plans to still start Ingram at small forward and Tarik Black at center when the Lakers (19-37) host the Sacramento Kings (23-32) on Tuesday at Staples Center and on Wednesday in Phoenix. The Lakers will then take off during NBA All-Star weekend in New Orleans before playing on Oct. 24 in Oklahoma City. The question seems as difficult to answer as it did in trying to stop of one of Magic Johnson’s no-look passes. Will Johnson ultimately remain a Lakers advisor in matters pertaining to the franchise’s business and basketball operations? Or will the man that led the Lakers to five NBA championships on the court also be in charge of leading them from above?